When you’re not gaining victories, finding ways to actually win becomes more difficult. Just ask captain Shane Doan and his Arizona Coyotes teammates. Traversing through another frustrating game and equally challenging season, the Coyotes showed more grit and energy Tuesday night than in recent, listless encounters. Even coach Dave Tippet agreed the effort was there and his team made a desperate attempt to ward off evils spirits. Still, the bottom line was the typical of the season and the Coyotes dropped their fourth game in the last six starts. This time, it was a 3-2 decision to the San Jose Sharks before 10, 10,631 in Gila River Arena, the second smallest crowd of the season. When you’re losing, little things become big and mystified. A repeat performance skating with the man disadvantage haunted Arizona, once more, and this team, last in the league in allowing power play goals, allowed the Sharks to go 1-for-3 on the power play. Yet, the game-winner was a fluke and shot from San Jose defenseman Brandon Dillon, his first of the season, deflected off the toe of Arizona defenseman Zbynek Michalek and in behind goalie Devan Dubnyk at 5:15 of the third period. That snapped a 2-2 tie and broke San Jose’s modest two-game losing streak. While Dubnyk turned away 22 of 25 shots, Dillon’s goal was the most aggravating. Though the Coyotes turned in a creditable effort, they must, at this point of the season, find ways to be more competitive. Doan talks all the time about “finding ways to win,” and players echo that sentiment. It’s like playing without the puck and putting the team in position to compete at high level every night. Tippett agreed and told reporters after the game that discipline and playing “smart hockey” are ways to overcome the current malaise. Mired near the bottom of the NHL, players are now telling reporters after games and practices that current conditions are simply not favorable. That seems to be the status quo for most of this forgetful hockey season and circumstances do not appear to be moving in a positive direction. At this point, there’s not much else Tippett can do or try. He’s switched the goalies, changed lines, endured injuries, matched different defensive pairings, change players’ position on the ice and changed personnel on special teams. 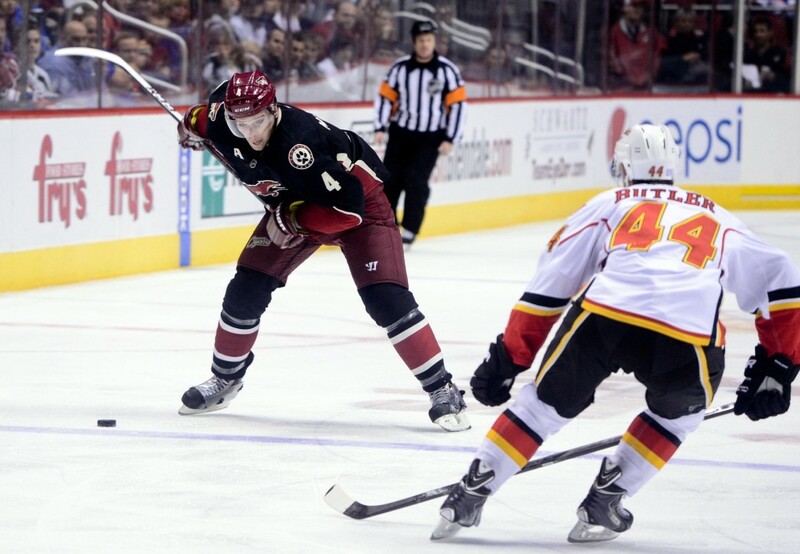 Nothing seems to work and now the Coyotes face a streak of eight straight road games. After Thursday night’s game home game with the Flames, the road trip commences Saturday night against at Minnesota. Then, it’s off to Winnipeg, Chicago, Philadelphia, Toronto, Ottawa, Montreal and Columbus. If the season is in a free-fall now, the drop should be telling by Feb. 5. That’s when the Coyotes return home to face Carolina and, likely, confront the fate of their season.